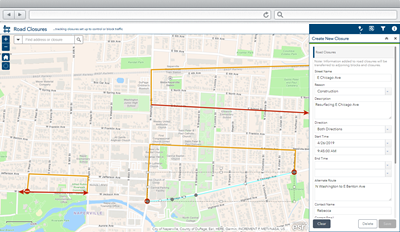 Road Closures is a configuration of Web AppBuilder for ArcGIS that can be used by engineers and operations staff to maintain an inventory of road closures, and communicate closures and detours to travelers. Road closures and related detours are typically defined by a transportation department, and/or emergency management agency during special events, public safety incidents, and construction activities. Focused road closure maps can be embedded on your website and shared with the general public. To deploy Road Closures with the ArcGIS Solutions Deployment Tool requires specific software. To manually deploy Road Closures in your organization requires specific software. ArcMap or ArcGIS Pro can be used to configure the feature layer provided with this solution. Application Road Closures An application used by engineers and operations staff to maintain an inventory of road closures, and communicate closures and detours to travelers. Map Road Closures A map used in the Road Closures application to track roadblocks or closures. Feature layers RoadClosures_public A public feature layer view used to share current and planned road blocks, road closures with location affected, and detour routes. Below are the release dates and notes for Road Closures. Road Closures can now be deployed in your ArcGIS Organization with the ArcGIS Solutions Deployment Tool. A new set of workflows to help share road closure information with consumer navigation and traffic applications.